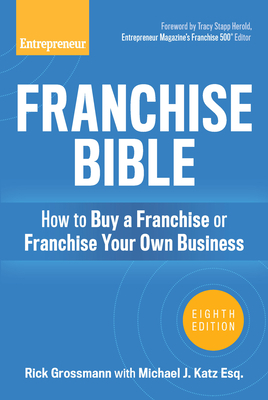 The Insider's Guide to Buying a Franchise or Franchising Your Business In this easy-to-read guide, franchise expert Rick Grossmann and franchise attorney Michael J. Katz impart decades-worth of insight and advice on what it takes to make your franchise operation successful. Grossmann and Katz share expert tutorials, tricks of the trade, and access to sample franchise documents, checklists, and questionnaires designed to get you organized, support you through the process and get your new franchise off the ground. If you're thinking of franchising your existing business, you'll learn how to: Pick the best method for expanding your business Understand the keys to establishing a successful franchise system Evaluate potential franchisees and grow your franchise Whether you want to buy a franchise or franchise your own business you'll learn what to expect, how to move forward, and how to avoid costly mistakes--making Franchise Bible required reading. Rick Grossmann is co-founder and managing partner of My Franchise Hub (myfranchisehub.com). Mr. Grossmann has been involved in the franchise industry since 1994. He franchised his first company and grew to 49 franchised locations in 19 states during the mid to late 90's. He served as the CEO and primary trainer focusing on franchisee relations and creating tools and technologies to increase franchisee success. Rick franchised his second company in 2003. He served as the company's CEO and Marketing Director. He developed the high tech/high touch franchise marketing and sales system selling over 150 franchises in North America capturing ranking in Entrepreneur Magazine's Top 500 franchises in less than three years. Grossmann has also served as a business and marketing consultant to small companies and multimillion dollar enterprises. He also consulted Franchisees and prospective Franchisees, Franchisors, and companies seeking to become Franchisors. He was a co-author on the previous edition of Franchise Bible. Michael J. Katz is an attorney specializing in franchise law. He is a published author, lecturer, and teacher, as well as the senior partner of Corporon & Katz, a law firm specializing in franchise, business, and real estate law.